Some Germans have come up with a new name for their country: "Germoney." In fact, they have made a new flag for their homeland. Out goes the tricolor of black, red and gold. 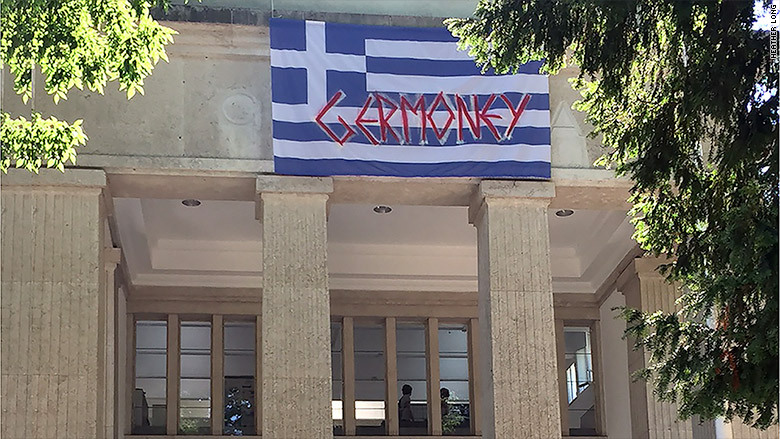 In comes a Greek flag bearing "Germoney" in big red letters. The redesign is the work of a group of German artists, who hoisted the flag above the official German building at one of the biggest art festivals in the world -- the Venice Biennale. Their aim: To demonstrate solidarity with the people of "Greece and all other places suffering austerity." "As cultural workers and artists, we demand an end to austerity in health, culture and education while public funding for banks and oligarchs seems unlimited," the artists said in a Facebook post. Many countries have pavilions at the Biennale to showcase the work of their artists and designers. They usually fly their national flag. The stunt illustrates the controversy surrounding Europe's repeated financial rescues of Greece. Germany has been the biggest single contributor, and many Germans are increasingly hostile to the idea of putting more money into a third bailout that is currently being negotiated. Others say the bailout money has kept banks and the rich afloat, while penalizing the poor through savage spending cuts and tax rises. A tale of two pavilions at the Venice Biennale. Greece's pavilion stands in stark contrast to the German building in Venice. It has been built to look dilapidated to highlight the country's recession -- parts of the walls have been torn out and there is mold painted on the ceiling. 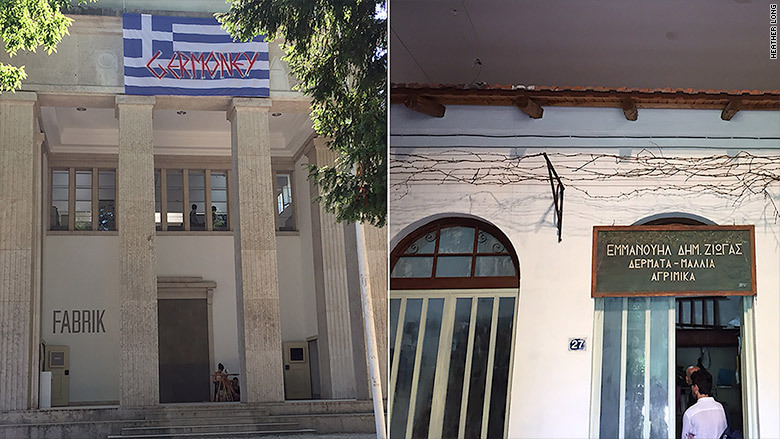 Greek staff at the Biennale say the Germans didn't ask for permission to paint over the Greek flag, but they did ask to borrow one. Unfortunately, Greece didn't have one to give.